One of the great modernist films and one of the quintessential portraits of existential brooding, Michelangelo Antonioni's La Notte proves that emotional disintegration can be gorgeous. Stunning and stark, the film's first half is one of the most formally precise depictions of alienation ever captured, with Antonioni pinning Marcello Mastroianni and Jeanne Moreau against the sleek, clean and dark surfaces of Milan's modern architecture. The second half is a simmering pot of unspoken disappointments and disillusionment as Mastroianni and Moreau's couple attend a party at the house of a wealthy industrialist and his daughter (Monica Vitti) threatens to make the emotional distance all the more obvious with her sly flirtations. Mastroianni stars as Giovanni Pontano, a reasonably successful author, and Moreau is his wife, Lidia. The film opens somberly, as they visit a friend in the hospital who isn't expected to live much longer. A champagne toast in the room has all the merriment of a particularly invasive medical procedure, and the dour mood isn't confined to that room. On his way out, Giovanni is accosted by a seemingly crazed patient, and he falls into her embrace almost involuntarily. There's no joy, no excitement, no connection at all as these two bodies press into each other. As Giovanni and Lidia split off to do their own thing, the inner ennui/despair of each is emphasized by Antonioni's compositions, a sole figure backgrounded by a brick wall, elevator doors, a gate. Even when Lidia visits a comparably much more rural hometown, where people gather around to witness fistfights and rocket launches, she's framed as an outsider, one all alone. When the couple reunite later in the evening to attend the party, their solitude still reigns supreme. As Valentina Gherardi, Vitti is her typical captivating self, smoldering as the promise of something more exciting or at least something different. As Giovanni moves closer and closer to her, Lidia engages in her own flirtation, but pleasures, even fleeting ones, aren't really on Antonioni's menu in La Notte. In this modern world, connection and reconnection lie out of reach. 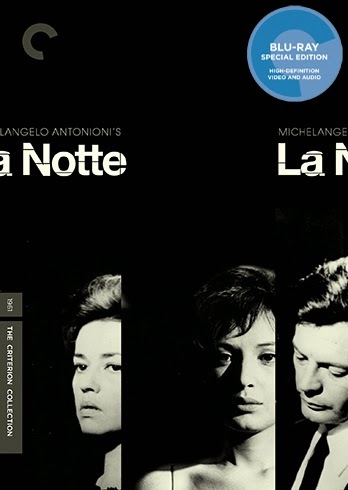 Criterion presents La Notte in 1080p high definition and a 1.85:1 aspect ratio. The film's dramatic black-and-white imagery looks fantastic, with clean whites, sharp and deep blacks and excellent shadow detail. The transfer's clarity and film-like qualities are consistent throughout, and only very minor instances of wear or damage are visible. The uncompressed mono soundtrack is just fine, presenting a clean rendition of the dialogue-heavy, dubbed-in-post soundtrack. The extras are a little light this go-around. An interview with scholars Adriano Apra and Carlo di Carlo touches on the film's themes and production, while another interview with Harvard professor Giuliana Bruno focuses on the film's use of architecture to visually communicate its ideas. The disc also includes the theatrical trailer. The included booklet features an essay from the always interesting Richard Brody and a reprint of a piece by Antonioni. Criterion has finally brought La Notte alongside L'avventura and L'eclisse in the collection, and it's beautiful transfer is very welcome.